While Kansas City is known for the Joe&apos;s Kansas City Z-Man, there’s another sandwich you’ll hear about when looking for top local picks, the Gen Dare. This juicy burger, topped with melted cheese, hash browns, grilled onions, ketchup, mustard and pickles, is perfectly placed on a seeded bun and can only be found at Fritz’s Railroad Restaurant. The local franchise’s original location, found in Kansas City, KS, has been a well-known family favorite for more than 50 years. Besides the deliciously greasy food, what makes this retro diner so popular is its quirky twist. 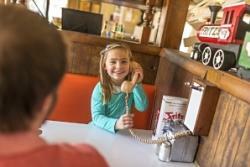 Guests place their orders from old-fashioned telephones, and trains ride overhead delivering food from booth to booth. Kids will squeal with delight over getting to wear Fritz’s conductor hats and watching the trains chugging by as they “choo-choo” before each stop. 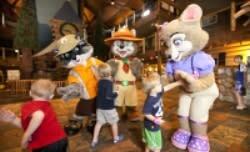 Great Wolf Lodge is the ultimate Midwest family getaway. Guests can sleep in a gorgeous woodland suite, complete with fun log cabin themed bunk beds for the kiddos. Spend your chilly winter day in a giant indoor waterpark that stays 84 degrees all year round! Splash around in the activity pools, warm up in the two luxurious hot tubs (pssst…one is just for adults), zoom down the Triple Twist, or choose from one of the other crazy fun waterslides. Each December, Great Wolf Lodge transforms into a festive wonderland with visits from Santa, special activities for kids and even a nightly snowfall in the lobby. Moon Marble Company is arguably the most unique attraction in the Kansas City area. Located in Bonner Springs, KS this hidden gem is easy to miss, but it’s a must see! Stop in to the colorful store to explore beautiful hand crafted glass-blown jewelry and other trinkets, and timeless toys and games. 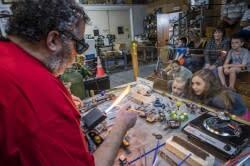 Certain days out of the week you can even watch live marble making demonstrations that will light up the eyes of anyone from ages two to 92. Not everyone is a happy camper when it comes to holiday shopping, especially if they know the shopping isn’t being done for them. Legends Outlets Kansas City is a great place to keep the family occupied while you pick out the perfect gifts. 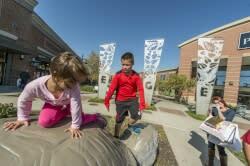 The outdoor shopping, dining and entertainment center provides a free scavenger hunt where kids can explore and learn about famous Kansas legends through different sculptures and murals. During the holiday season store hours are extended, and the Civic Courtyard Fountain gets an extra special addition – a giant, bright Christmas tree. On November 19th, bring your family to the 12th Annual Legendary Tree Lighting Ceremony for live music, prizes and a jolly special guest.